I have finally accomplished a major roadblock in my quilting life. I have pin basted my unfinished quilt, my Garden Charms quilt, which has been lying around for more than a year. It was initially a Craftsy project, a class taught by Lynette Jensen. I followed the pattern completely, except for picking my own colors. Finishing this quilt has been nagging at me for such a long time that I have been in such a quandary over it. My quilting life had to take a backseat to my personal life—I have just had too many other responsibilities that have kept me from doing the activity I love. I’ve had a hard time getting back to it. The piecing gave me fits. I re-did several steps in this multi-step process. The pattern was complicated, but that is also what made it lots of fun to complete. I even made a table runner out of a couple of the pinwheel blocks to practice. It turned out great, so I was more comfortable with all those points. It came out imperfect, but not bad. I wrote about this in a previous post. Over a year ago I ordered eight yards of fabric for the quilt back. Until very recently, it remained in the bag in which it arrived. Finally, just a month ago, I measured it and cut it, sewed it, and turned it into my quilt back. The most challenging part of quilting for me is the small space for which I have to work. 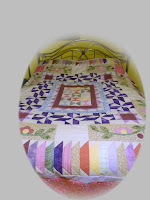 I watched several videos about laying out and basting the quilt in a small space for inspiration. Finally, the other day I bit the bullet, I cleared off my small dining room table, (a feat in itself) purchased a few small clamps to keep things taut, and some curved safety pins, and set out to pin baste this quilt. Alas, it wasn’t as difficult as I thought. This is the largest quilt I have ever attempted, so it was a bit unwieldy to put it onto my small dining table without wrinkles and without the constant help from my four cats. I know it is going to be a challenge to machine quilt this quilt, but I am determined. I know I’m not the first to be intimidated by this. 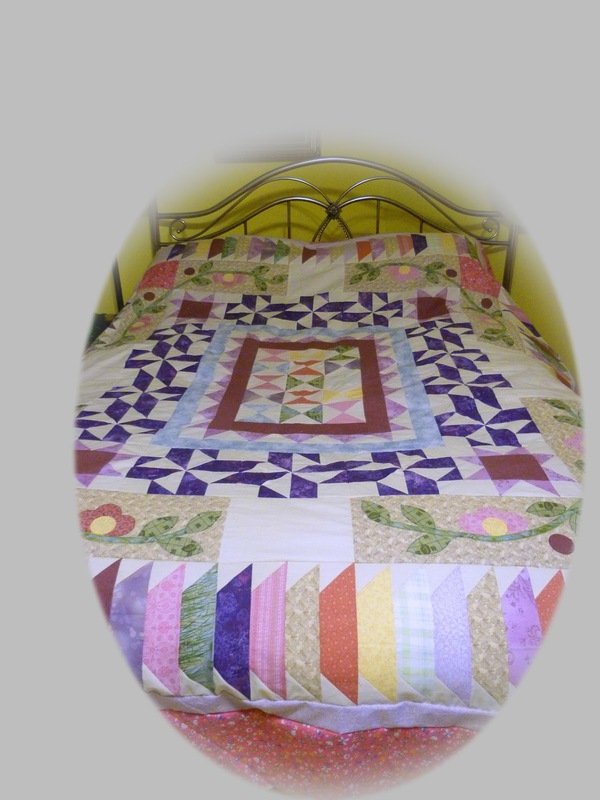 Most of the free-motion projects I have done have either been ‘quilt as you go’ projects or small pieces. The biggest quilt I’ve ever machine quilted was a baby quilt. That was a breeze, so I figure this is just like four of those, albeit attached. I’m not sure when I will start this, but I’m getting rather excite. My next step is to take a picture of the various aspects of the quilt, print it out as a line drawing, and design quilting designs. I think I’m going to use all white thread, since the quilt is so colorful. Or, perhaps I’ll use hot pink, which might be fun. I’ll have to figure that out too. I look forward to a subsequent post which will answer those questions and report on my progress. Wish me luck.